Court halts sack of 21,780 Kaduna teachers – Royal Times of Nigeria. 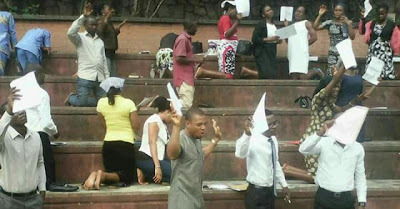 The National Industrial Court of Nigeria, Kaduna division, on Thursday, halted the planned sack of 21,780 primary school teachers who failed a competency test organised by the state government. The lawyer representing the teachers, Samuel Atum, had on October 30 filed a motion of interlocutory injunction, asking the court to restrain the government from dismissing or disengaging any teacher on the basis of the test conducted in June 2017. Justice Lawal Mani granted the application pending the determination of the substantive suit. The case was adjourned to February 6th, 2018.